Bauer celebrated over 700 Fall 2011 graduates ranging from undergraduate, graduate and doctoral programs during the commencement ceremony held on Dec. 16, 2011 in Hofheinz Pavilion. 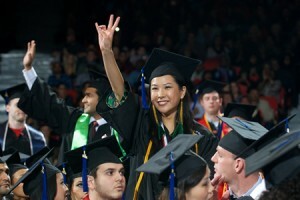 The University of Houston C. T. Bauer College of Business celebrated Fall 2011 graduates at a commencement ceremony on Dec. 16 in Hofheinz Pavilion on the UH campus. The University of Houston recently restored the esteemed tradition of General Commencement as a way for the university to honor all graduates and achievements in a grand celebration. UH Bauer graduates from undergraduate, graduate and doctoral programs claimed their degrees during the Dec. 16 ceremony. UH System Chancellor and UH President Renu Khator honored the accomplishments of the graduating class with a keynote address. Bauer College Dean Latha Ramchand also congratulated all degree candidates from the college and presented them to the president for the bestowal of their degrees. Sarah Watkins was born and raised in Houston. 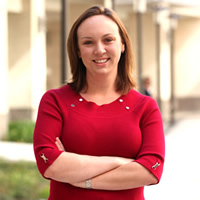 She took a scenic route to the finance profession by first earning a Bachelor of Arts in International Affairs at Florida State University and then coming to the University of Houston for an MS Finance degree. While pursuing her graduate degree, Sarah worked full -ime as a retail manager and then shifted careers this summer, now working as a consultant with The Lab Consulting. During her time at the University of Houston, she had the privilege of being part of the Cougar Investment Fund. It was through the fund and Professor Thomas George that she attributes her opportunity to change career paths. 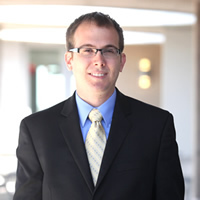 David Burman first began at the University of Houston a decade ago by pursuing a degree in Hotel and Restaurant Management. After completing the degree and working several years, he returned to UH to pursue his MBA. During his time here, David was very involved with the Bauer MBA Society, serving first as the Promotions Chair and then being elected as the Executive Vice President. His contributions led to the first mentorship program and resume book for the society. David would especially like to thank Marian Newman and Lisa Jammer for their tireless effort in advising him throughout his time at Bauer. Nuria Seijas is graduating with an MS in Accountancy, with concentrations in Risk and Audit. She earned a BBA in Accounting and a BBA in Finance from Bauer College in December 2009. She graduated from the Bauer Business Honors Program and was named the Outstanding Undergraduate Student for Fall 2009. During her time as a full-time graduate student, Seijas served as a teaching assistant for Intermediate Accounting I and Accounting Lab Coordinator. Additionally, she had the opportunity to work for The Rand Group LLP, and Deloitte and Touche, LLP. Seijas received the Department of Accountancy and Taxation’s Leadership Excellence Award in the Spring of 2011, and is the recipient of the Wayne Miers Family Trust scholarship and the AICPA Minority scholarship. 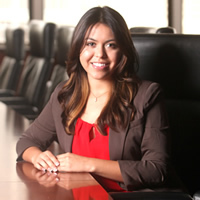 Seijas is currently pursuing her CPA certification and will join Deloitte in January of 2012.